The Electrolux Design Lab, established as a European initiative in 2003, is celebrating its third con-secutive year of meeting the highest international standards in future appliance design and innovation. Today, Electrolux Design Lab brings together the creativity of promising design students from around the world to the challenge of meeting the needs of tomorrow's consumers. Cathy Huang, as the only judge from Asia Pacific region, joined the 7-member jury and witnessed the rising of Asian Design. The Design Lab 2005 attracted 3040 students from 88 countries as far as Germany, France, Italy, China, USA, Australia and Brazil. From them, an initial board of Electrolux designers selected 12 finalists, who were mostly from Asia Region (some students from Europe or America were also Asia-born). The young designer team from Zhejiang University of China won the 2nd place with a conceptual washing machine with the Flavor of Sunshine, while the champion and the 3rd place winners were from Singapore and Korea. Electrolux CEO Hans Straberg issued the award to the winners in person. An impressive award ceremony party was held in the famous Blue Hall in Stockholm. When asked by the local TV station what's the feeling about the final awards all went to young desig-ners from Asia Pacific region, Cathy remarked, "The final judgment was fair and it's the whole jury's decision. Asia has relatively weak industrial design power due to some reasons culturally and econ-omically, but Asian designers are much diligent and hard-working. Especially the younger generation potential designers are very excellent, innovative and creative. I am happy to witness the rising of Asia design industry. I am proud of it!" 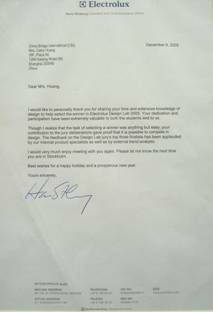 Cathy received a thanks letter with Electrolux CEO Hans Straberg's signature when she came back to CBI's office in Shanghai. I would like to personally thank you for sharing your time and extensive knowledge of design to help select the winner in Electrolux Design Lab 2005. Your dedication and participation have been extremely valuable to both the students and to us. Though I realize that the task of selecting a winner was anything but easy, your contribution to the jury deliberations gave proof that it is possible to compete in design. The feedback on the Design Lab jury's top three finalists has been applauded by our internal product specialists as well as by external trend analysts. I would very much enjoy meeting with you again. Please let me know the next time you are in Stockholm. Best wishes for a happy holiday and a prosperous new year.